Deanah McCormack Counselling Services in Tralee, Co. Kerry is now offering sand play and art therapy services. Sand Play Therapy is a unique form of therapy which originated through Margaret Lowendfeld's work as a psychiatrist in London with children. She identified it as "The World Technique". In later years, Dora Kalff while completing her studies with Carl Yung recognized the potential of Lowenfeld's "Word Technique" and further developed the method. 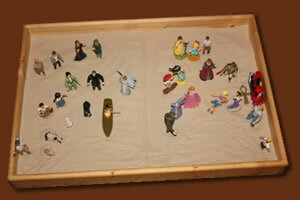 The process of Sand Play Therapy involves the use of sand trays, sand, water and miniatures. By it's nature sand play therapy allows us to experience the spontaneous and compelling forces of creativity. The miniatures used act as a form of energy, bridging the divide between our unconscious and conscious. The sand-tray provides the boundaries that contains the work unfolding providing; insight, clarity and an opportunity to reflect. Sand play is symbolic, non-verbal and experiential. As such, it can be of benefit to all persons. However, it is particularly beneficial for children and adolescents. This particular form of therapy provides an expressive outlet for children in their most natural state of curiosity, through play. Sand play therapy can be used to improve outcomes in family therapy. Forming a scene in the sand can take us away from our heads and into a felt and more whole experience of ourselves. Art Therapy is an expressive form of therapy in which a variety of materials such as; paint, pastels, markers, charcoal, clay etc. may be used creatively. The process of Art Therapy allows us to tap into our own creative forces that move us in the direction of well being and wholeness. Similar to Sand Play Therapy, Art Therapy is non-verbal and is a non-threatening way of symbolically representing our inner world, when words are too difficult to find to describe the complexity of our experiences. This particular rmodality is highly beneficial for; children, those with limited communication or language skills, psychological distress or learning difficulties. 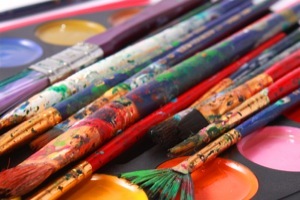 Art Therapy can be used, across a diverse range of community settings including; mental health, medical, rehabilitative or educational services. You can contact me through the website, or at (087) 175-6857 if you would like to avail of these services or require any further information. Depressive disorders include depression, seasonal affective disorder and post-natal depression. Mood disorders are categorized into two major groups with several related sub-categories. Depression is diagnosed in line with specific criteria typically through a mental health screening with a local G.P. or another qualified mental health professional. Bi-polar disorders are characterized by marked periods of mania as well as depression. Manic episodes are diagnosed in accordance with particular criteria through mental health screening with a qualified professional. The precise cause of depressive disorders is still a matter of scientific research. However, it is thought that genetic, environmental and cognitive factors such as trauma, loss or an unwelcome event may all contribute to the onset of a depressive disorder. Counselling can help you to allay any fears you may have in relation to depression. It may also be helpful in assisting you to address negative thought patterns, triggers, low self esteem and relationship issues. Developing a positive sense of self and self worth. Self- esteem refers to how we feel about ourselves and our individual level of self worth. It can be easy to confuse self-esteem with self confidence. Although they are similar, they are not the same. Confident people may suffer the effects of low self-esteem too. Consider some public leaders or celebrities who in front of a camera may appear supremely confident. The same individuals, when out of the public domain may be lacking in self esteem. Self esteem relates to how self deserving we feel in areas of success, love, business, relationships, achievement, parenting or work. When low self-esteem permeates our lives, it affects our living. It can leave us feeling hopeless, rejected and depressed. It can lead to critical self talk which only adds further to feelings of low self worth. Our formative experiences during early years are thought to play a significant role in the development of self-esteem as is our experience within the educational arena during infancy through adolescence. Temperament and how we perceive and interpret the demands of our environment play a part also. Counselling can help you to develop an insight to your true sense of self and self worth. Working on self assertiveness can help to enhance self esteem. Reviewing past conditioning and events may help an individual to understand how this relates to their current challenges. In 2001 the ESRI published the result of the first nationally representative survey of the incidence of workplace bullying in the Republic of Ireland. Over 5,200 individuals in paid work outside the home participated in the survey. 7% of those surveyed reported that they experienced bullying in the 6 months preceding. Dr. Mona O’Moores (Trinity College, Dublin) National survey of Bullying in Irish primary and secondary schools points to some 31% of Primary Students and 16% of Secondary Students having been bullied at some time. Bullying can be defined as the “persistent, offensive, abusive, intimidating or insulting behaviour, abuse of power or unfair penal sanctions which makes the recipient feel upset, threatened, humiliated or vulnerable, which undermines their self-confidence and which may cause them to suffer stress.” Definition of Bullying by Amicus – MSF Trade Union. In a corporate environment there are many forms of bullying. Corporate bullying may introduce new policies designed to deny employees their enititlements, or create an environment that coerces employees into greater responsibility and working longer hours. Organisations may harbour a serial bully, or facilitate pair, gang, vicarious, legal or cyber-bullying. Within the school environment bullying takes various forms. It may be physical and include pushing, tripping or hitting. Verbal bullying may include publicly demeaning another, engaging in persistent gossip and rumour mongering. Non-verbal bullying includes intimidating looks or gestures. Emotional bullying may include isolating an individual and persistently chipping away at their sense of self. With the event of technology at our fingertips e-bullying has become an aspect of school life. Physiological symptoms: a compromised immune system and susceptibility to infections and illness; sleeplessness; nightmares and fatigue; Irritable bowel syndrome; blood pressure; sweating; loss of appetite and aches and pains. poor concentration; becoming withdrawn; loss of confidence and self esteem; irritability and feelings of despair; thoughts of suicide. Behavioural symptoms: Absenting oneself or avoiding work or school; aggression and self medicating through substance abuse. When a child is being bullied through extortion they may report money or possessions regularly being lost. There are many underlying reasons that one might engage in bullying behaviour. Bullying attracts attention, increases ones sense of superiority and power, or alleviates feelings of inadequacy. Bullying may also be a behavioural manifestation of a distorted mindset. For the recipient, bullying is an insidious form of abuse that erodes ones sense of self and sense of purpose and can even lead to suicide. A counsellor’s role is to help either the individual who is engaging in bullying behaviours, or the person at the receiving end to look at their patterns of interacting with others and self-beliefs. A counsellor may help to examine issues around self esteem, assertiveness and self confidence. Further work may look at client’s redundant beliefs and promote healthier thought patterns. Stress and the Mind, body & spirit. Stress is a physiological reaction to events that shake us or push us off kilter. The body has an inherent way of reacting to stress by producing adrenaline which gives us our “fight or flight” ability. This allows us to respond effectively to stressful situations and protects us. However persistent stress puts the bodies coping capabilities under pressure and over time, can l ead to significant damage and ill health. Emotionally: It can leave us feeling drained; edgy; overwhelmed; teary; moody; irrational; highly reactive; oversensitive; feeling isolated and over a period of time can lead to depression and anxiety if not addressed. Mentally: It can lead to a lapse in short and long term memory, an inability to stay focused or concentrate on tasks in hand, constant negative chatter and thoughts and can feed our anxiety making us feel even worse. Physically: long term exposure to stress can lead to serious health problems. It can cause heart attack, stroke, panic attacks, nausea and bowel problems, high blood pressure, sleeplessness, it can trigger asthma and can affect our appetite. Spiritually: can make us feel worthless, dejected and wondering how are we ever going to get out of this pit. Individual ability to deal with stress differs. How much a person can tolerate depends on many factors like; what is currently happening in a person’s life, their self-beliefs, support systems in place, past experience of stress and how one coped. Temperament and general disposition is also a factor. My role is to help you identify triggers, beliefs and values that contributed to the increase in your stress levels and develop coping strategies. Counselling may also offer the opportunity to examine issues of low self esteem and evaluate personal beliefs that may have contributed to increased stress in your life.